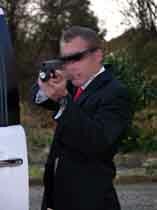 The Brillstein Security close protection wing consists of internationally experienced professionals. We operate on highest level only and any risk level. We don't employ cowboys and show-offs. If you are looking for the best personal, VIP and/or close protection, Brillstein Security is the right partner for you. We insist on complete, comprehensive training for our personnel. We do not limit protection to the pure, simple "body guarding". We operate with a specialist team to supply an all around deep vertical and horizontal protection, according to highest standards of the security industry and official agencies such as US Secret Service, Israeli Shabak/Shin Bet, SAS and other elite units. In fact, many of our instructors have formerly been members in exactly these units, as well as French and South African official agencies. Brillstein Security is uniquely qualified to provide our clients with executive and close protection domestically and worldwide. We have operated globally in real world conflicts, which have provided us with real life experience in providing for the overall safety and security of our clients. Our highly qualified staff is multilingual and highly motivated. The Brillstein Security's combined operational experience and versatility is our greatest asset and ultimately serves to ensure the uncompromised well being of our clients. 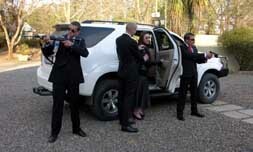 We offer close protection service worldwide - please contact one of our offices any time! Brillstein Security also offers a 12-month comprehensive study and training course as Professional Protection Officer (PPO) incl. 4 weeks in-camp highly intensive tactical workshop, 6 months internship PLUS guaranteed employment for each PPO graduate, full employment thereafter if performance has been satisfactory!